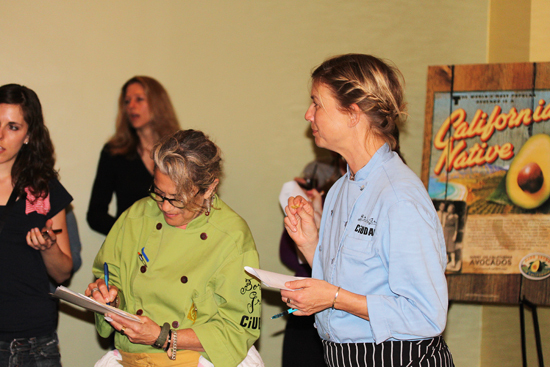 Last Saturday the California Avocado Commission hosted a Food Bloggers lunch and cooking demonstration at Ciudad with Mary Sue Milliken and Susan Feniger. 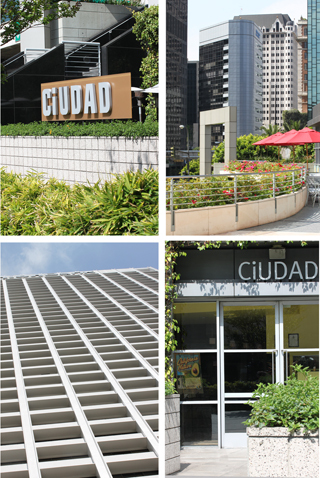 Ciudad is located in downtown Los Angeles in the middle of the city-scape, the sky scrapers towering all around it. 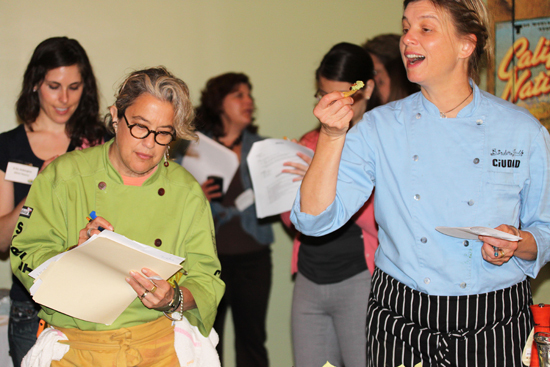 About 20 of us bloggers and food writers came together with our cameras and appetites to watch the Too Hot Tamales prepare four courses, all containing avocados, which would be perfect for Cinco de Mayo celebrations. 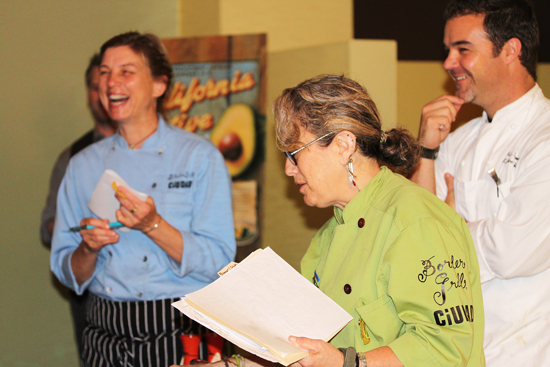 84.1 million pounds of avocados are expected to be consumed in one day during this year’s festivities in the U.S.
Next came the judging for “Best Name” and “Best Guacamole” which was done by Mary Sue Milliken, Susan Feniger and Jeremy Tummel, the Executive Chef of Ciudad. If Mary Sue and Susan disagreed, Jeremy was to be the tie-breaker. 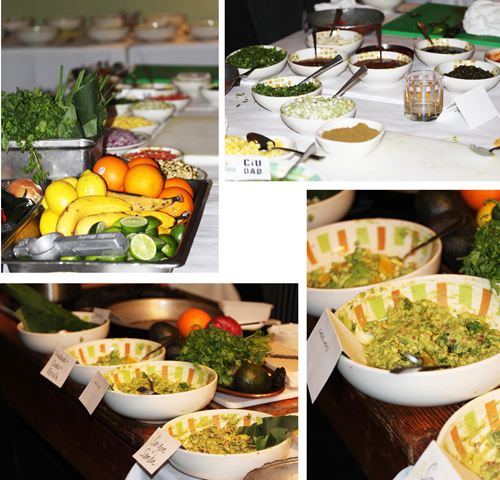 The name of each guacamole had to be explained and each tasted, while the creators described what ingredients they had used. There was a lot of laughing and teasing during this process. 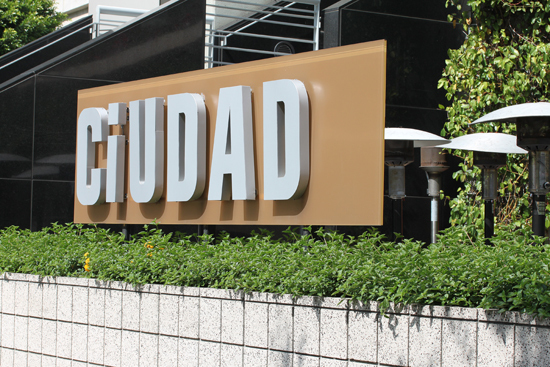 It was decided that the Best Name award went to “Pomocado Mole” and the Best Guacamole went to “Spud Not Guac Fully Loaded” which they said tasted like loaded baked potatoes. Awards were given and photos taken of the winners. 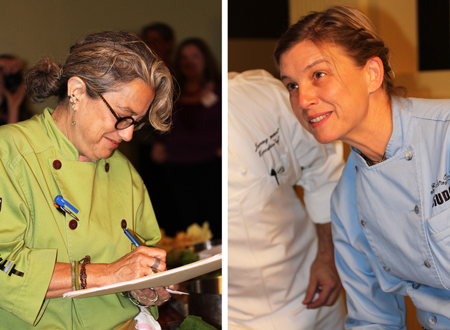 Next we were treated to a cooking demonstration by Mary Sue Miliken and Susan Feniger. They had a large cooking station set up in the back of the restaurant dining room with a grill and six-burner stove in the center. You can tell these two have been working together for years, because they finish each other’s sentences. Mary Sue is the straight man and Susan is the comedienne. 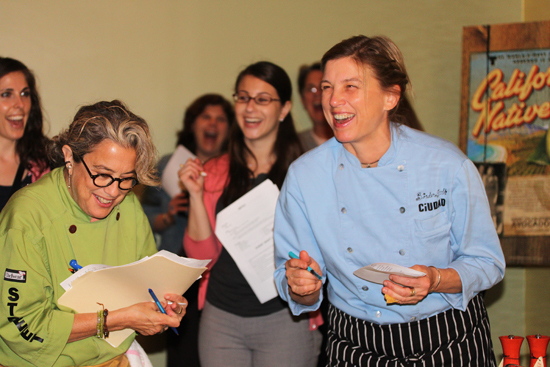 They kept us laughing through their whole cooking demonstration. If you would like to see a video of the Too Hot Tamales in action, you can go to the California Avocado Commission website. 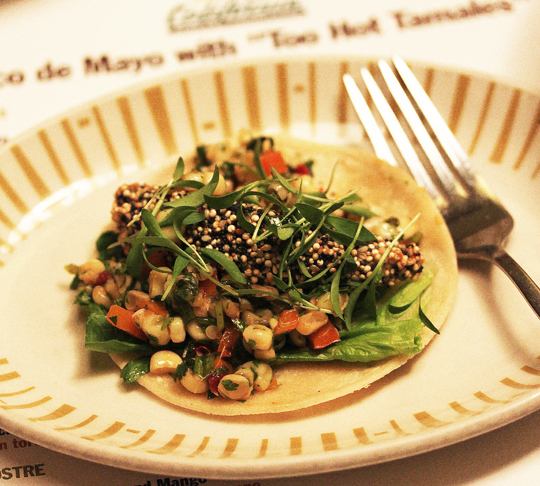 The first dish was a Crispy California Avocado Taco, which had a wedge of avocado encrusted with quinoa, poppy and sesame seeds, and then deep fried, served with a chipotle corn relish. For a printable recipe and more. 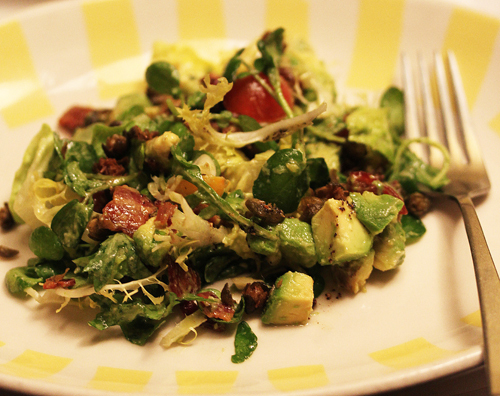 Next was a California Avocado, Bacon and Tomato Salad with frisee, watercress, romaine, red onion, mustard vinaigrette, crispy capers, and homemade croutons. 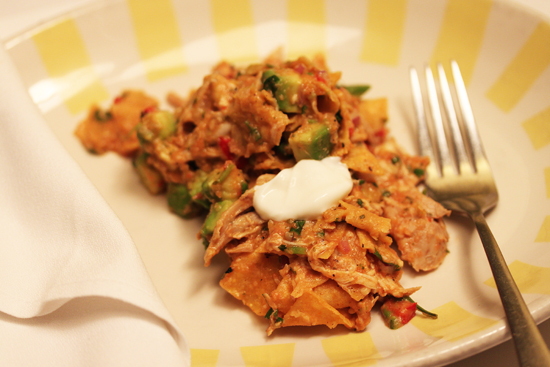 It was pretty much agreed that the Chilaquiles looked like a brown blob on the plate, but they really tasted good! Chicken and California Avocado Skillet Chilaquiles with corn tortilla chips, salsa roja, panela cheese, red onion, jalapeno, cilantro and lime. For a printable recipe and more. I have never had a dessert with avocado in it so this was a revelation. California Avocado and Mango with yogurt, honey, lime, touch of cayenne. 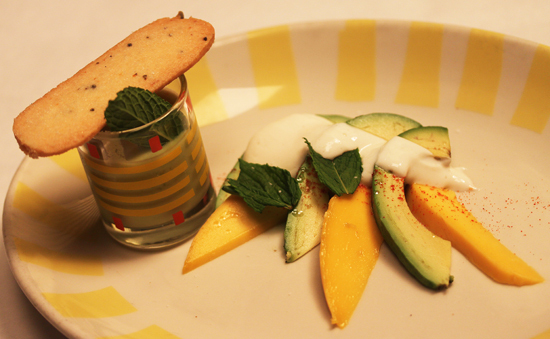 The little shooter glass held a California Avocado and Orange Liquado, sort of like an avocado smoothie. The lavender shortbread cookie was divine. For a printable recipe and more. 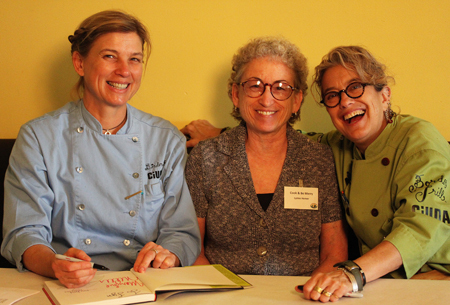 And the best moment of all… I got my book autographed and my photo taken with the Too Hot Tamales!! 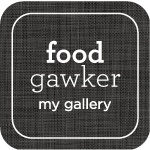 I am their total groupie and not ashamed of it! Lynne, what a fun event!!! The Avocado dishes are superb and so are the Two Hot Tamales!!! 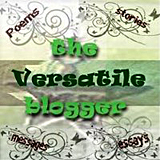 Next post: Linda Steidel’s Book Is Released!! !